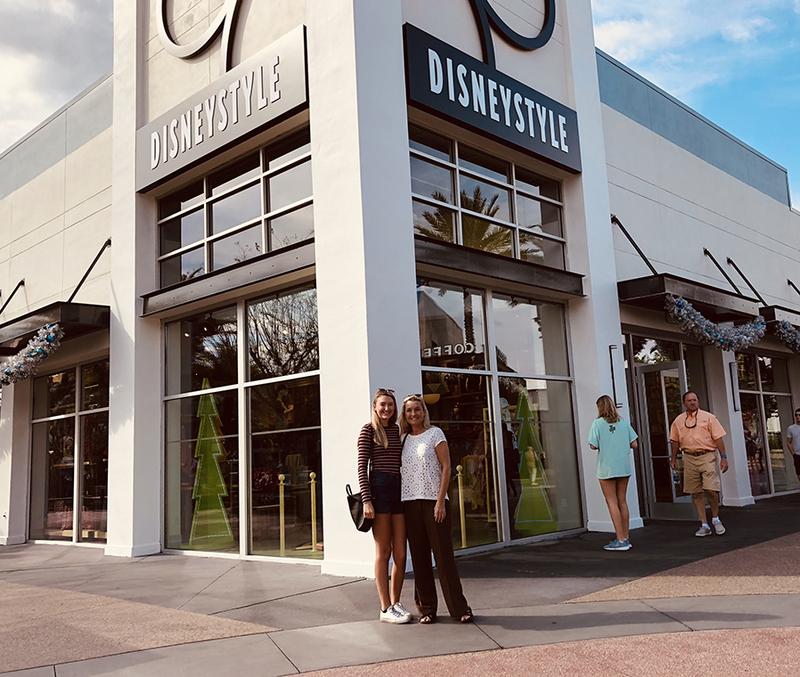 SUNY Adirondack Professor of Business Kelli Hatin, right, spends a relaxing day at Disney Springs with SUNY Adirondack student Kaitlyn Sarti, who is taking part in the Disney College Program. SUNY Adirondack student Kaitlyn Sarti, who is currently working in Florida as part of the Disney College Program, recently received a little Empire State hospitality. Professor of Business Kelli S. Hatin connected with Sarti while on a Florida vacation during Thanksgiving break. Sarti is working as a greeter at the popular Chef Mickey dining experience in the Contemporary Resort. According to Hatin, the intern sees on average around 900 covers per shift, with the Thanksgiving crowd numbering more than 1,400 during her shift. Only about 2,000 total students are accepted each semester from around the country, and the interns must make it through a three-step interview and selection process. SUNY Adirondack plans to send four students — Amber Rist, Erika Williams, Grant Leonelli and Maureen Ahl — to the resort for the Spring 2019 semester. The SUNY Adirondack Culinary Arts Center is using free-range chickens from Vincek Farm in both the classroom and the dining menu. SUNY Adirondack’s Culinary Arts program continues to develop strong farm-to-table relationships through its philanthropic efforts. The culinary team was paired with Vincek Farms in September at the Taste of Wilton celebration, with the students featuring the farm’s chicken in their dish. 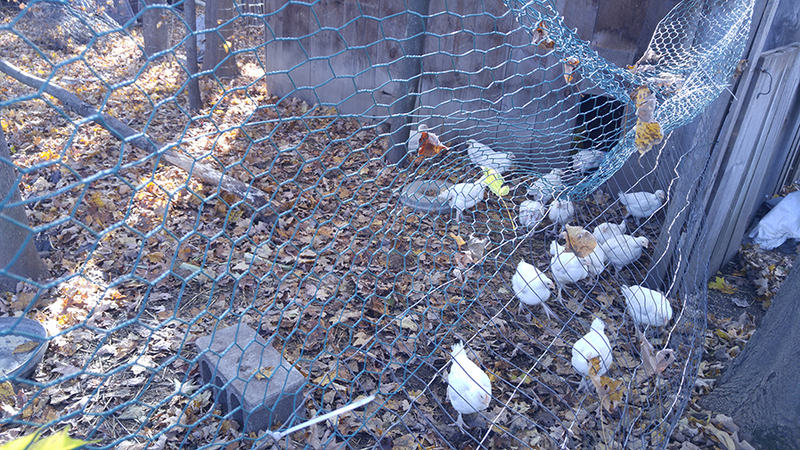 Culinary Instructor Matt Bolton visited the 100-year-old family-owned business after the event to check out the farm and it’s free-range chickens, which led to the culinary program purchasing whole birds for its poultry fabrication lesson. The chickens, which were recently delivered to the Culinary Center for classes to learn how to breakdown, will be featured on the menu at Seasoned, the student-run restaurant. 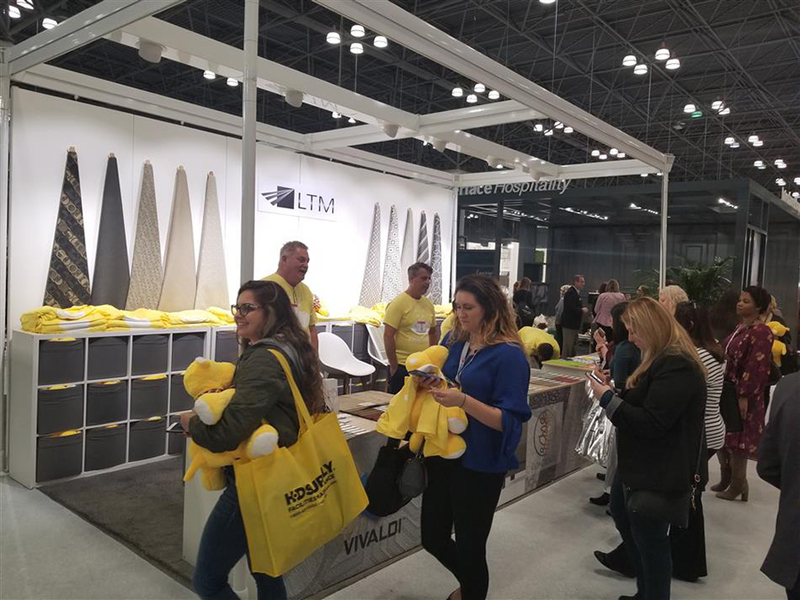 SUNY Adirondack students Meaghan Colin and Samantha Hamelin talked with representatives from LTM Textiles during the HX2018 conference in New York City. SUNY Adirondack’s Conventions and Events Management class took a Nov. 11 field trip to New York City to attend HX2018, a premier hospitality, hotel and events show at Javits Center. Led by Professor of Business Kelli S. Hatin, the group spent time talking with vendors, sampling new products and meeting the new CEO of HCareers.com. They also met with a facilitator of AllSeated, a digital event-planning platform. The class received AllSeated training and certification earlier in the semester. The Office of Student Life is seeking charitable donations for its annual Angel Tree program, which offers aid for SUNY Adirondack students during the holiday season. Last year, this initiative received significant support from the campus community, which allowed the program to provide assistance to a number of students in need. To become an Angel this season, contact Jennifer Leon, assistant director of Student Life, at leonj@sunyacc.edu. Participating students will receive a book, an item of clothing and a toy. Students can sign up for the program online at http://bit.ly/ADKANGEL2018 by Dec. 12. Angel Tree availability is limited and is on a first-come, first-served basis. 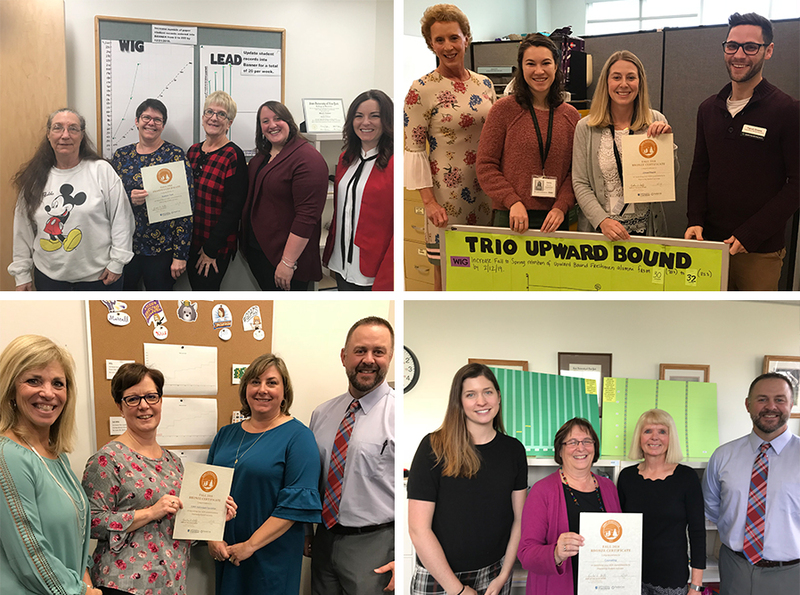 Four SUNY Adirondack departments — the Registrar’s Office, Upward Bound, the Foundation and Counseling — recently achieved Bronze certificates for commitment to the college’s 4DX project to increase graduation rates. Professor of Studio Art John Hampshire's multimedia piece 'Circuit Board' is among work he is showing in several regional exhibitions. Professor of Studio Art John Hampshire has work featured in two Capital District exhibitions. Hampshire is part of “Flow” at the University Art Museum in Albany. The show, which recognizes alumni artists from Mohawk Hudson Region Exhibitions from 2009 through 2017, runs through Dec. 8. He also is included in “En Masse” through Dec. 24 at Thompson Giroux Gallery in Chatham. Hampshire recently finished a three-month exhibition of his work at Music to My Hair, an educational salon created for artists by artists, in Latham. He is a juror for the “Black & White” show, which pens Feb. 15 at the Lake Placid Center for the Arts. 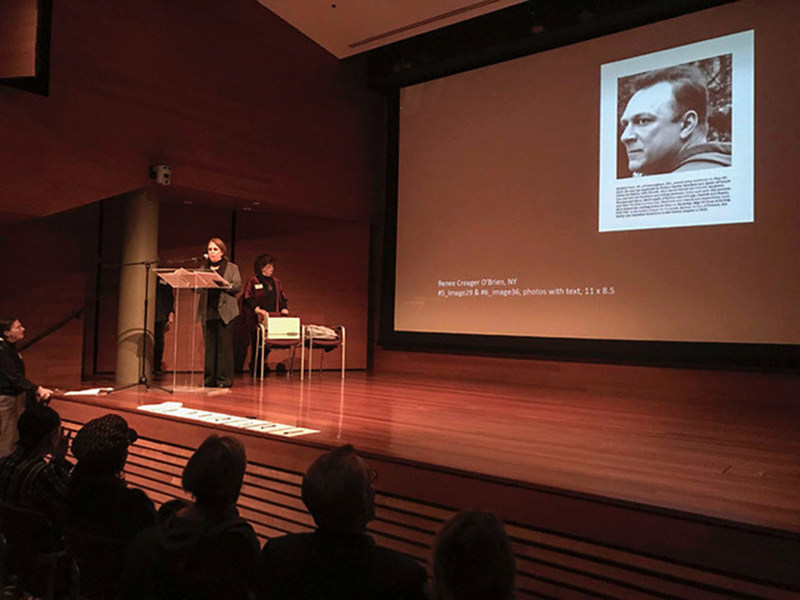 Professor of Photography Renee O’Brien recently spoke as part of her induction into the National Association of Women Artists. Professor of Photography Renee O’Brien was inducted into the National Association of Women Artists on Nov. 15 at the Rubin Museum of Art in New York City. O’Brien spoke about her work during the induction and gave a second talk at an reception following the ceremony at the New Members’ Exhibition at NAWA Gallery. NAWA was created in 1889 to provide greater opportunity for professional women artists in a male-dominated art world, an initiative that remains important today. The exhibit “Text/ures of Iraq” continues through Feb. 7 at SUNY Adirondack’s Visual Arts Gallery in Dearlove Hall on the Queensbury campus. Artist Oded Halahmy organized the show, which features work from his collection by nine contemporary Iraqi artists. The Visual Arts Gallery is open 10 a.m. to 3 p.m. Monday through Thursday and 5:30 to 7:30 p.m. Tuesday and Wednesday. The gallery will be closed from Dec. 21 through Jan. 14 for winter break. Student Recital No. 1 will be held at 12:45 p.m. Dec. 5 in the SUNY Adirondack Theatre. The concert is free and open to the public. Student Recital No. 2 will be held at 7:30 p.m. Dec. 6 in the SUNY Adirondack Theatre. The concert is free and open to the public. A Select Student Recital, String Ensemble and Vocal Ensemble performance will be held at 7:30 p.m. Dec. 11 in the SUNY Adirondack Theatre. The concert is free and open to the public. The Alumni Book Club will hold its monthly meeting at 6:30 p.m. Dec. 12 in Bryan Hall, Room 122. This month’s book is “Eleanor Oliphant Is Completely Fine” by Gail Honeyman. A Chorus and Guitar Ensemble performance will be held at 7:30 p.m. Dec. 13 in the SUNY Adirondack Theatre. The concert is free and open to the public. Faculty, staff and members of the Board of Trustees and Foundation Board are invited to the annual college Holiday Party from 3 to 4:30 p.m. Dec. 14 in Northwest Bay Conference Center in Adirondack Hall. The SUNY Adirondack Symphonic Band will mark the 100th anniversary of the end of World War I with a concert at 7:30 p.m. Dec. 14 in the SUNY Adirondack Theatre on the Queensbury campus. The program is free, rescheduled from November, and open to the public. UPDATE SUNYADK is published monthly during the Spring and Fall semesters by the Marketing Department. Have campus-related information you would like to share? Email grused@sunyacc.edu.